Unique for your restaurant, venue, lodge or a dinner party, birthday, wedding with a difference. We can make to your own design if you don't like ours. we also have a four and six spiked espetada with stand. MEDIUM SIZE MEASURES 42CM FROM TOP TO BOTTOM AND THE LARGE IS 68CM contact us for a free no obligation quote. 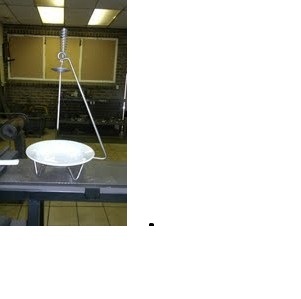 Our basic design costs R230.00 per espetada stand, spike and cup. Only other added costs would be for delivery if out of Pretoria.